Occupational therapy is a profession that helps people participate in the things they want and need to do through the therapeutic use of everyday activities (occupations). 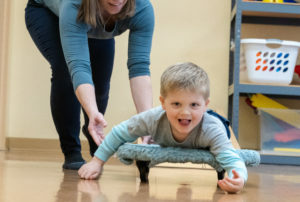 Common occupational therapy interventions include helping children to participate fully in school, family, and social situations, helping people recovering from injury to regain skills, and providing supports for older adults experiencing physical and cognitive changes. Occupational therapists have a holistic perspective, in which the focus is on maximizing the clients ability to participate by improving skills and abilities, modifying the task and/or adapting the environment. The individual and the family are an integral part of the therapy team. Sensory integration is the ability to organize sensory information for use. In a growing child, many senses must be developed in order for him to adapt and survive – senses of taste, hearing, vision, smell, proprioception (muscles and joints), touch, movement, and gravity. As a child develops, information from these senses combines, enabling him to automatically adapt to each new environment or setting. These senses protect him from harm and help him learn about his body parts in relation to each other. Soon he can balance his head, trunk and limbs for rolling, creeping, sitting, walking, standing. Once a child develops reflex maturation, body awareness and postural balance, he learns to control body functions and is ready for motor skills which demand more coordination. He masters riding a bike, jumping rope, skipping, catching and throwing balls, putting together puzzles, speaking, reading, writing, buttoning buttons, tying shoelaces. He learns to quiet himself when upset, interact with others and play with toys in a meaningful way. He masters his environment and gains feelings of adequacy, accomplishment, and inner self security. Problems occurring pre-natally, at birth or early in life may impair a child’s ability to integrate information from all of his senses. Some learning skills are blocked. One child yearns to communicate but cannot form words, even though his hearing is perfect. Another is bright-eyed but clumsy. Still another runs like a deer, swims like a fish, but cannot fix his attention on any one task for more than a few seconds. She frustrates easily, and/or breaks out in temper tantrums. She is unable to play independently. She has difficulty dressing herself. She is disorganized. Impaired sensory integration shows up in older children too. One child is of above average intelligence and is learning in school, but has great difficulty with reading or written communication. Another has sharp vision and hearing but prints his ABC’s backwards. He holds a pencil awkwardly. Left and right confuse him. Among other children, he soon begins to feel inadequate; he develops a poor self-image, becomes destructive, refuses to keep trying, becomes disruptive and aggressive, cannot adapt to group settings. Why does this happen? What can be done to develop the missing skills? Is it too late? Often, sensory integration can be improved with appropriate treatment. Occupational therapists skilled in this approach can help a child more fully realize his potential by building a better foundation for skills to develop and/or compensate for deficits. The therapist also works to help parents and teachers understand these limitations which are most significant to the child’s daily performance. With a sound treatment program, a child can be helped through trying times to overcome physical and emotional challenges, to adjust socially, and to fit more comfortably into her environment. It takes a coordinated effort, however. Parents, teachers and doctors play a key role; they must understand and accept the goals and methods of treatment. Parents, especially, must relate closely with the child and share his joy of accomplishment when he develops new abilities. Teachers must be aware of how much performance to expect in school… when discipline is needed and when it is harmful, and how to motivate a child using his most effectively developed skills. The family doctor, psychologist or neurologist must realize to what extent a child is hampered by sensory integrative dysfunction in order to prescribe accurate, effective medical treatment. Later in life, an employer may need to know a young person’s special needs as well as his special skills, so he can work productively with satisfaction and fulfillment. Occupational therapy for sensory integrative dysfunction begins with understanding the problem. After evaluation, the therapist explains to the parents aspects of sensory-motor functions that are problems. This determines what kinds of intervention might be indicated. The therapist also suggests what attitudes and expectations may best aid the child’s progress, since it sometimes takes many months to show the effects of treatment. Discussion with teachers and other professionals may be indicated. How Does A Child Respond? Often, the benefits from occupational therapy using sensory integrative procedures are not immediate. Significant improvements may take time to develop. Some children respond to therapy better than others. But when parents, teachers, therapists, and other disciplines coordinate efforts in treating a child, some major improvements are almost always achieved. Most importantly, the improvements though this sensory integrative approach continue to benefit the child during his adult life. Children do not outgrow sensory integrative dysfunction. They may develop compensatory strategies for specific problems. This need to compensate for underlying deficits, however, can take its toll on the person. Stress and anxiety, poor interpersonal skills, low self esteem an/or poor work habits are frequently seen in adult clients. Evaluation, detailed history and current concerns are critical components of identifying sensory integrative dysfunction in adults. Intervention includes individual therapy and support to change life patterns including a “sensory diet” to promote improved integration and more effective compensation. A support group may also be helpful for adults/adolescents to help deal with life issues.